These Chipotle Maple Tofu Tacos with spinach and smashed avocado, fresh lime juice on top are an easy and satisfying plant-based, protein-rich meal. This spicy-sweet tofu is the perfect filling to mingle with buttery avocado and a light layer of healthy greens. I love to serve my tacos with hot sauce and vegan sour cream, ranch or mayo on top. Get the recipe and make these tonight!.. Corn or flour. You can serve these tacos using any tortilla you’d like. These even fill a crunchy taco shell nicely. You could also use an extra large wrap for a burrito, or stuff a pita pocket with these fillings. Simple Flavor. When it comes to “Mexican food” I can definitely go overboard with components. Beans. Rice. Guac. Salsa. Fresh cilantro. Cabbage. Jalapeños. Skillet veggies. Tofu. Cheese. Sour cream. There are so many possible toppings for tacos. But I really tried to restrain myself for this recipe and keep let the deliciousness of the tofu and avocado really shine through. Keeping things simple means that you can have you meal ready in a flash too! Which is always extremely helpful. Especially as we wind around to the fall season and school year. To Nooch or not to Nooch? So one ingredient I left out of the recipe below:nutritional yeast. BUT, I have made this tofu about a billion times and love playing around with the spices and a beloved vegan fave: nooch, aka, nutritional yeast. It adds a savory, cheezy flavor that works very well with the Mexican spices and tofu. It even goes well with the hint of sweet from the maple. It also adds some texture. Tip: Nooch is great troubleshooting ingredient for correcting soggy tofu. Sour Cream. The traditional white, creamy, lovely sauce on top of Mexican food: sour cream. Well vegans have a bunch of options for this! I looooove making my own cashew sour cream. I also love just adding vegan mayo, my fave is Vegenaise. Or vegan ranch. You can DIY vegan ranch or buy it. If you buy it, try the JUST or Follow Your Heart brands. I also love the JUST chipotle mayo. Hope that helps! Oh, and you can always add some vegan cheeseshreds if you want.. In My Kitchen. I am personally in ‘clean out my fridge and pantry’ mode since we are moving very soon. Grocery shopping during moving week feels pointless, so getting through as many goodies as I can is my goal. I have a bunch of tortillas, sauces and more ready for me to get creative with. I also love this recipe so much because you can really eat it any time of day. These tacos are great for lunch or dinner, but even breakfast! They would pair really well with some fruit juice or even a latte – breakfast burrito/taco style. Hope you are feeling prepped, inspired and happy for September. And if you need some school-time recipe ideas, check out these posts.. 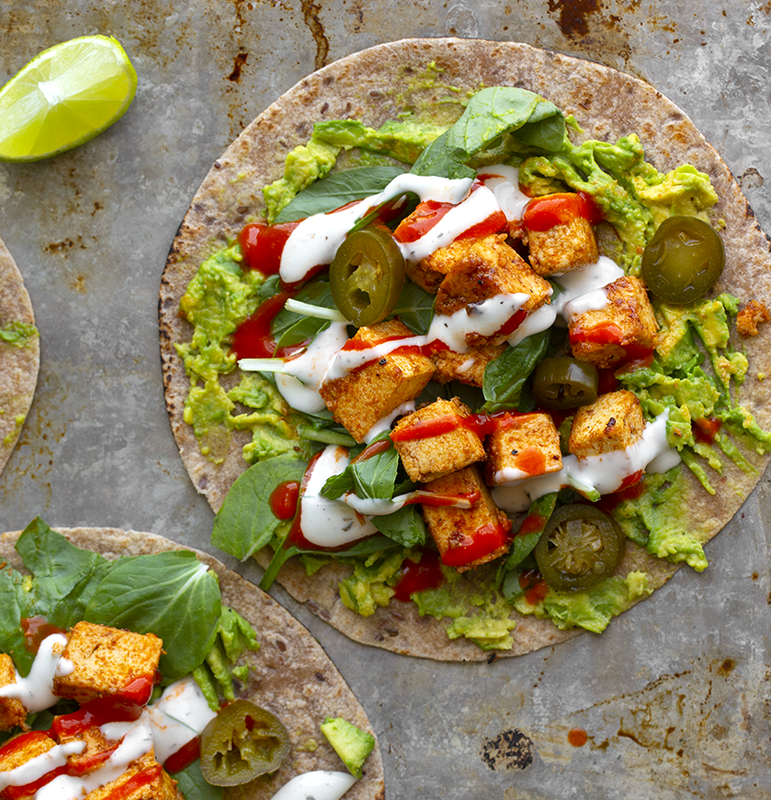 These simple tofu tacos include chipotle-maple tofu cubes, spinach, smashed avocado and a few sauces over top. Pickled or fresh jalapeños too. Prep the tofu by draining all the liquid. Squeeze the tofu, gently, while wrapped in a clean dish towel or a bunch of paper towels. Pat dry. Slice into small cubes. Set aside. Warm a large skillet over high heat. Add a drizzle of extra virgin olive oil. Add the tofu to the hot oil. Using a spatula, toss the tofu in the oil a bit to lightly coat all sides of the tofu. If needed, add another splash of oil. Cook for 3-4 minutes, tossing every minute or so. Tip: Do not toss your tofu too much, you want to get a nice deep sear on the edges, so sitting in the hot pan, untouched allows that intense heat to build on one side of the tofu. When the tofu is starting to brown a bit you can reduce the heat to medium and add in the spices: cumin, chipotle, salt and pepper. Start out with just a touch of salt and pepper and add more to taste at the end of the cooking process. Toss the tofu a bit. Next, reduce the heat to low and add in the maple syrup and hot sauce. By now, your tofu should be nice and browned so the liquid really only coats the edges and doesn’t make things mushy. Troubleshooting: If your tofu is feeling mushy, you probably needed to sear (cook in just the oil) for a few more minutes or more likely, you didn’t squeeze enough water out of your tofu before slicing. It’s ok if your tofu is a bit crumbly though! It will still taste amazing and some people actually prefer it crumbled! You could even completely mash it into a ‘sofritas’ texture. Allow the coated tofu to sizzle in the pan for a minute or so, then turn off heat. Let the tofu rest in the pan for a few more minutes to allow the sauce to carmelize a bit as it cools. Warm your tortillas and slice your avocado. Mash the avocado into the warm tortillas. Add a handful of spinach over top. Then scoop the warm tofu over top the spinach. Finish things off with a drizzle of hot sauce and optional vegan ranch or vegan mayo. Squeeze some fresh lime juice over top to serve. Enjoy!